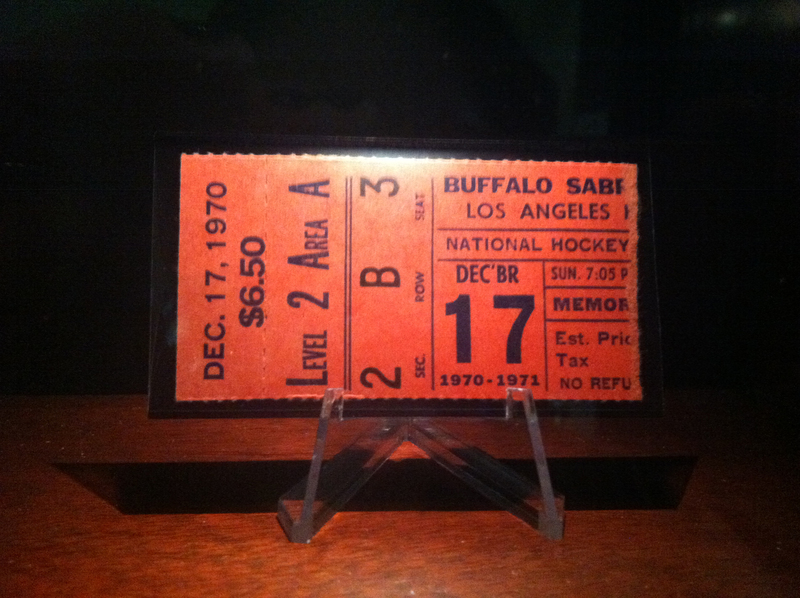 One of the many tickets on display from the 1970-75 Sabres seasons. Growing up in Kenmore, my friends and I played street hockey until it was too dark to see the bright orange ball. When Sega Genesis came along, NHL ’93 was one of my first games. We played every day after school. (To this day, NHL’14 is the only reason I own a Sony Playstation) I was like a lot of kids, hockey was just always in our lives. 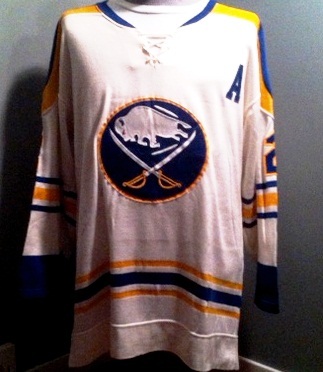 Tim Horton’s last worn home jersey before his tragic accident. I’m on a ladder, installing into a case the last home jersey that Tim Horton wore before his tragic car accident. Sometimes I feel bad that other people can’t have my job. Since our Buffalo Sabres exhibit opened last Friday, I have met countless people who have come in to relive some of the team’s early days. They share with me their stories. They tell me about how their first game, their favorite moments, and their favorite players. In that moment, you realize that we are all so similar. In that moment you realize that, someday, you might be in their shoes. We all seek to share stories with one another. What better place than here?